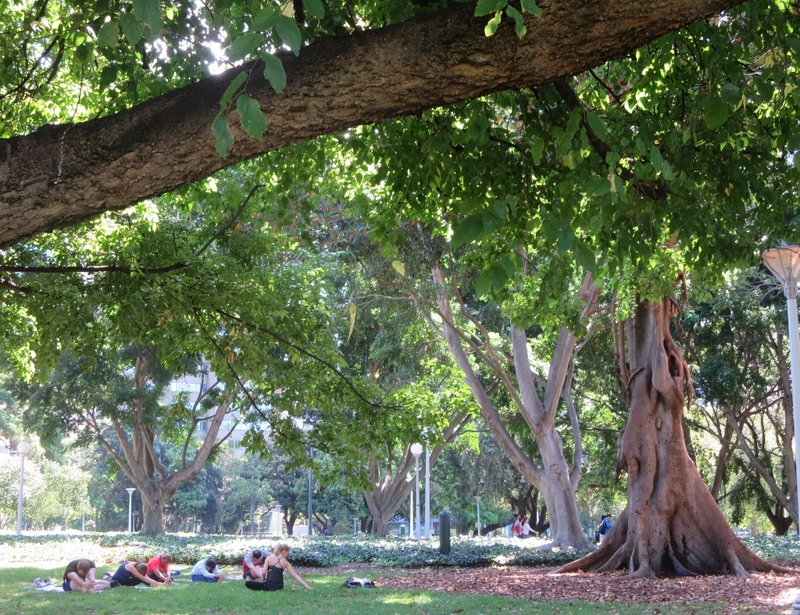 Sydney’s Hyde Park…shade, rest and music! Can a city ever have too much greenery? 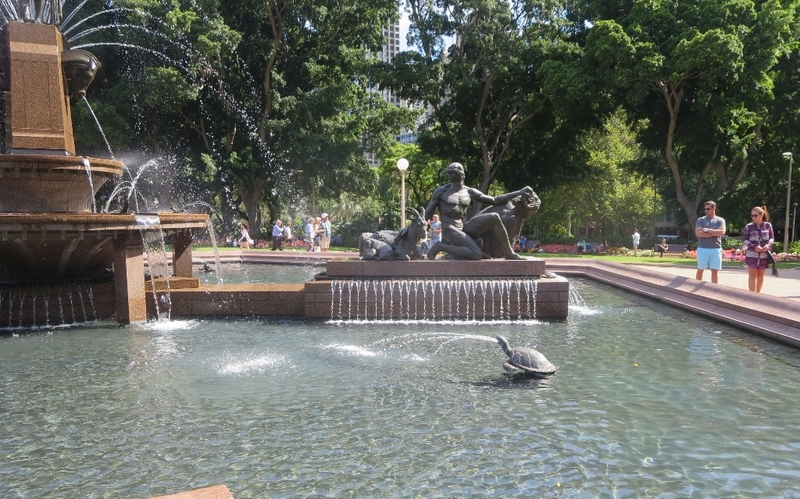 We recently spent time in Sydney with my Scottish cousins…. 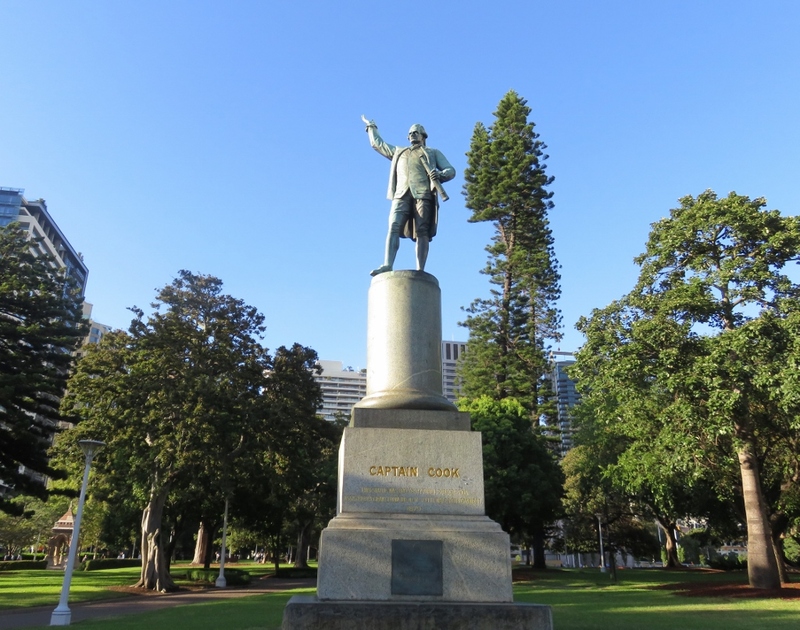 Captain Cook, born in Yorkshire, landed in Australia in 1770…..what a contrast to the city we see today..
We walked through Hyde Park every day, and we were grateful to have these enormous trees giving us so much shade in Sydney’s hot summer. 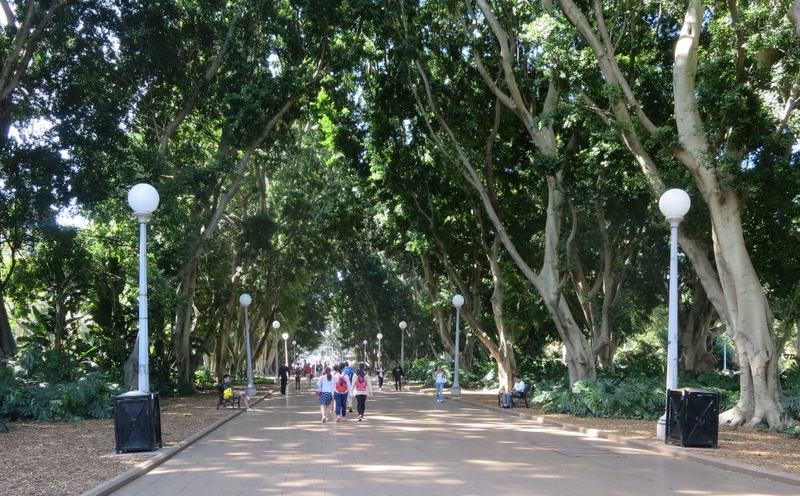 Jane Jose in her book Places Women Make says… liveability means being able to walk to a park, near where you live, have shady trees and seating and ”accidental connectedness” to your neighbourhood or city…. an early morning yoga class.. The park gave me a connection with people, and I began to feel part of the city. 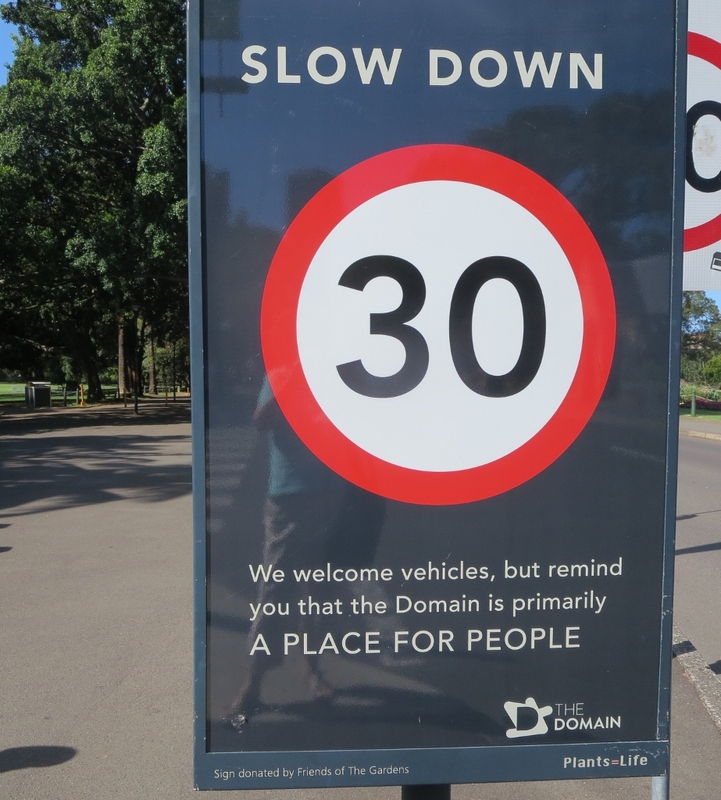 I love this sign, ”A place for people” …what a great reminder for all big cities!! 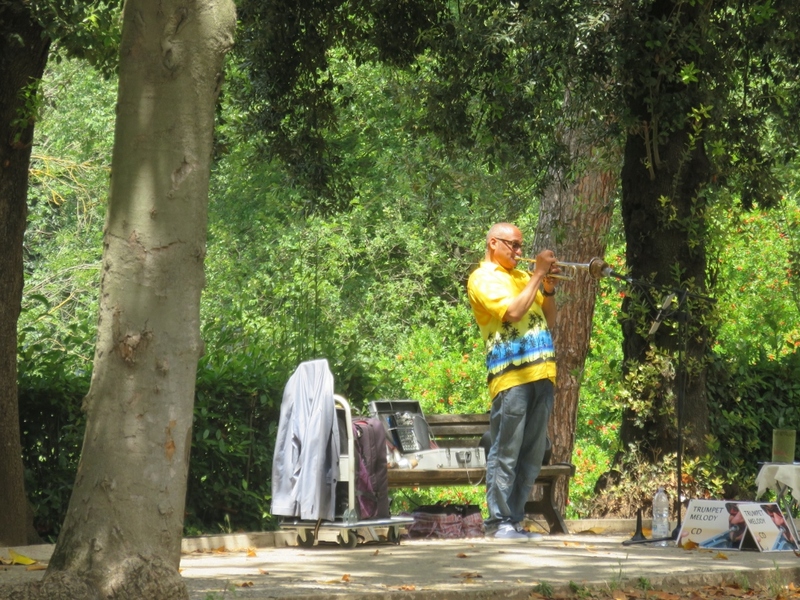 Most of all I love buskers and music in the city….I always give some money to someone who is providing music….it is the food of life! 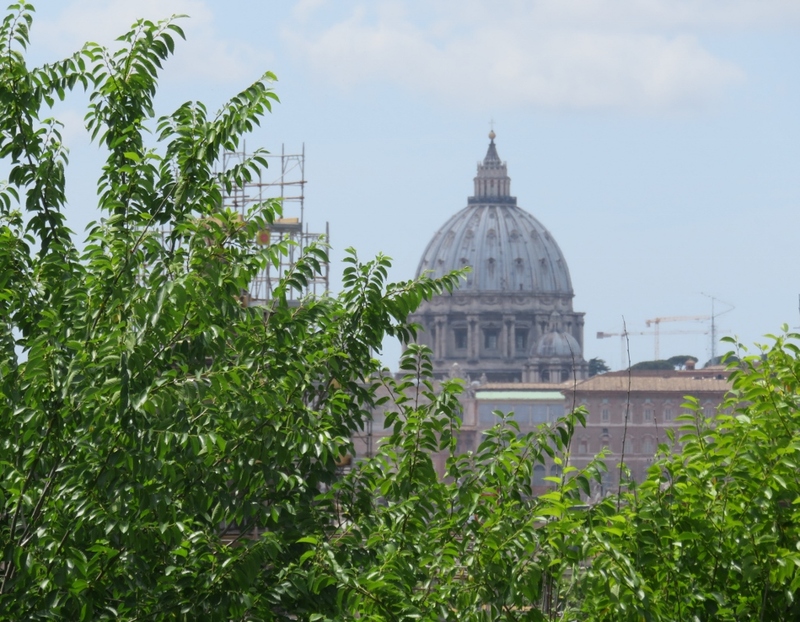 I’ll end with another beautiful, but exhausting city, Rome…we were there in May last year. Do you have a favourite park in your part of the world? 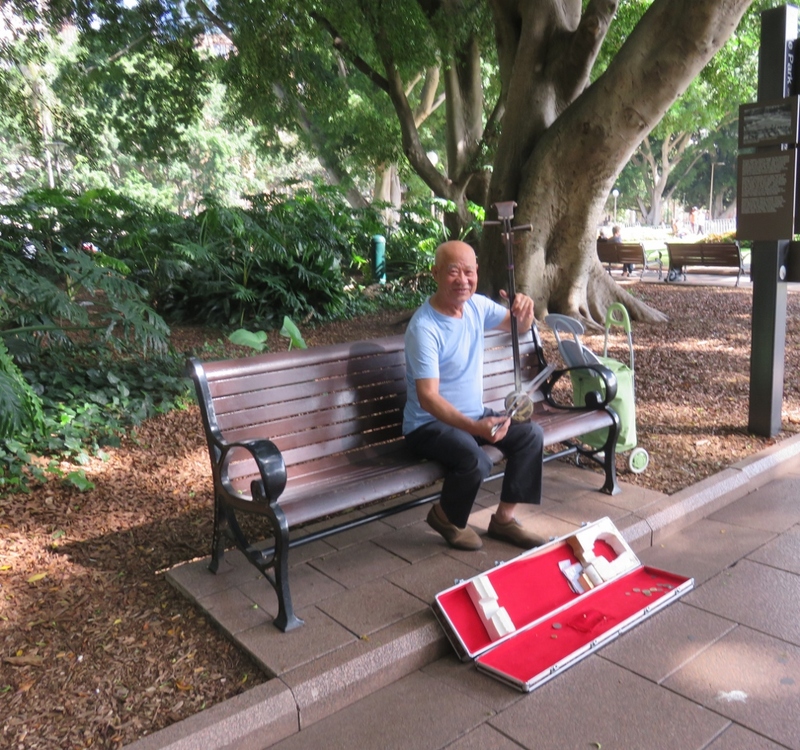 This entry was posted in Sydney's Green Spaces and tagged buskers, Captain Cook, fountains The Domain flower boxes, jazz, Kookaburra, music, parks green spaces, Rome, Sydney Hyde Park, trees yoga on March 30, 2017 by germac4. Lovely views of the greenery in Sydney. My favourite London Park is Regents Park, it has so much variety. You’ll have to do a post on Regent Park … I think we may have been there years ago … London is another city with beautiful parks.. When our grandchildren visit, we always feed the ducks at Falls Park here in Greenville. I love countryside hikes, but it’s also fun to mill around with others in a beautiful urban setting. Sydney is high on my list. Yes, having a place to take children is another aspect of having green spaces for all. Glad you liked Sydney. Yes you are right about buskers … They can seem a little haunting … There is one in Melbourne (one of our daughters lives there) that fits that description .. Yes .. The next time we are in Melbourne I do one on street art & buskers ..Melbourne is interesting for both.. Thanks for sharing your world! 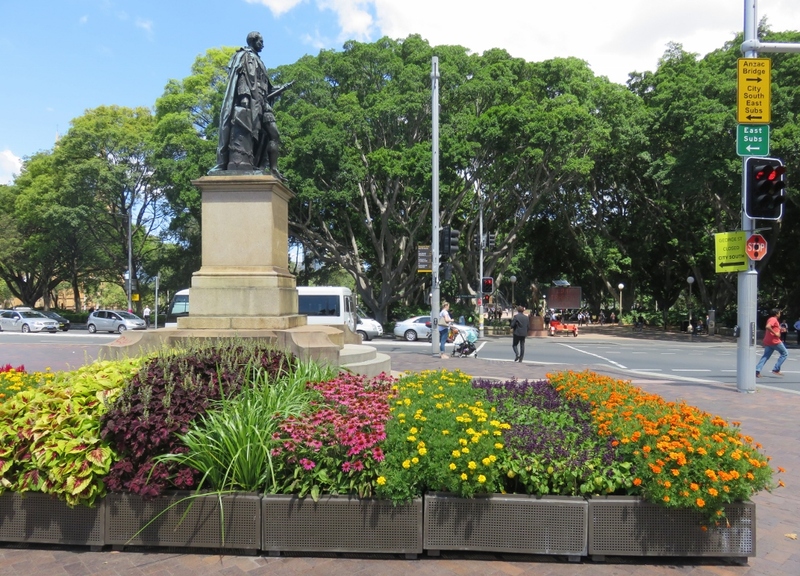 Lovely planters and sophisticated urban area. Thanks Diane! Yes the town council have done a great job in Sydney. I have more of that park feeling at Kirstenbosch. A green space that people enjoy. The newer Green Point Urban Park is also popular. I’m always sorry we did not get to Kirstenbosch. All I know of Tencel fibre is the material I had from it was lovely and soft, but also strong. I think I know where Hyde Park is, but how little we saw of the city in the couple of days we were there. 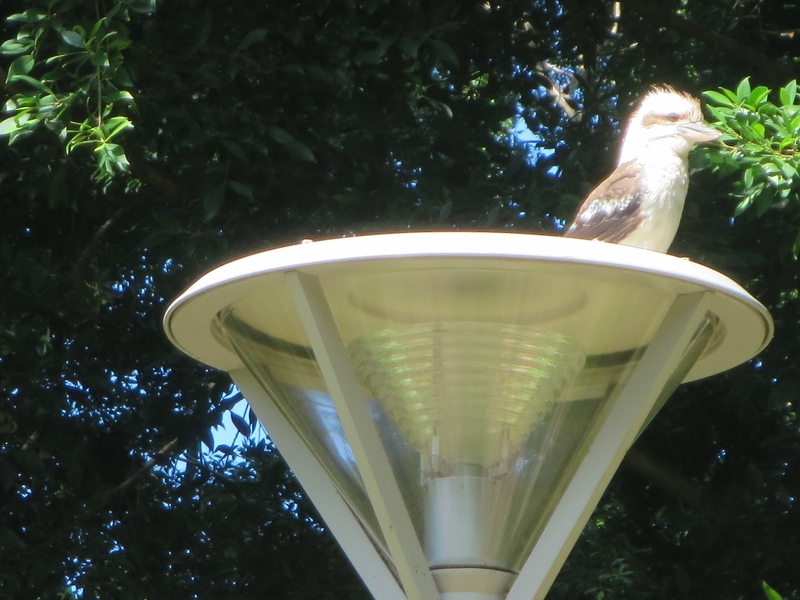 Love the kookaburra on the light.. but love them anywhere to be honest! Yes, the Kookaburras have their own charm and seem quite at home in the city. Hyde Park is just a block away from the Botanic gardens. In parks everywhere, from city spaces to national parks, I always give a silent thanks to the forward-thinking people who understood how necessary it is for people to retain pieces of natural, non-human, growing things around them. As for parsley, it’s so lush and textured, it’s a perfect floral backdrop Plus, it’s good to eat. Finally, Captain Cook sure got around. He was a major player in two of my favorite places in the world–Alaska and Hawaii. My office in Anchorage (Alaska) looked down on a monument to Captain Cook, where his statue faced across Cook Inlet, a gorgeous expanse of extreme tides, mud flats, whales, ravens, eagles and distant mountains. Imagine a life exploring through such places of incredible beauty. Maybe worth the violent ending. Very interesting to know that there is a monument to Captain Cook in Anchorage .. & what amazing sights he saw on his travels .. You painted a wonderful picture of the Cook Inlet. Yes, I too am eternally grateful for national parks & green spaces in cities. 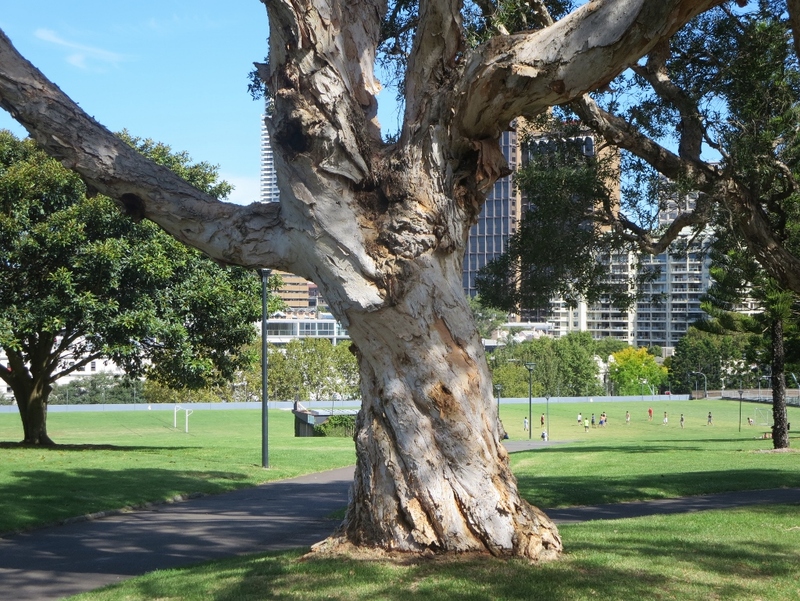 Sydney & other cities in Ausralia are going through a time of rapid growth & I hope we will have the foresight to include green spaces as our forebears did. It’s always lovely to see some greenery and nature in the midst of a big city. You have shared the magic, the flowers, trees, people, buskers. Hobart has a delightful small St David’s Park. As recently in London, I enjoyed both Green Park and St James’s Park. 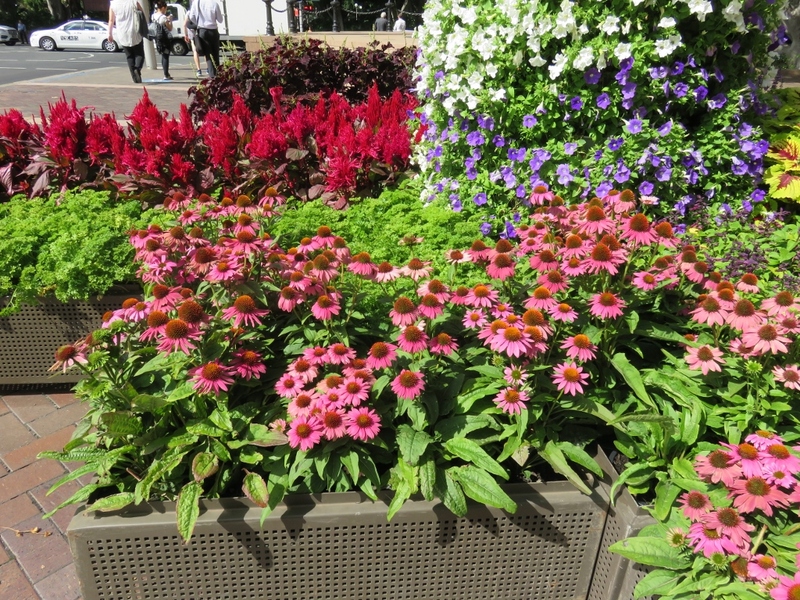 We stayed near St James park with our daughters when they were young… Lovely parks in London! We also know St David’s park near the Salamanca Markets (I think.) It was lovely in Autumn. So true Judy….some parts of Sydney are getting very crowded now….we probably need more forward thinking people! So true about New York Central park, it has a space for everyone and everything! Imagine that much land being kept for green spaces today….? Looks like a really fun urban park – lots of personality! Yes, always nice to have a good green space in a big city. I think the little parks cared for by local people are such simple but lovely ways of people connecting with each other.